Once known as the Sledging Field, this meadow is now a Community Nature reserve with over 400 species of flowers, grasses, insects and birds. It is managed as a traditional meadow with an annual mowing to encourage the sort of wildflowers that are fast disappearing from our landscape. The 5 acre field is surrounded by hedgerows and woodland and there are fine views from the higher points across the valley. On a clear day you can see Penarth and beyond that England across the Bristol Channel. There are several benches around the field, some in the sun, others in shade. Mature trees enclose the site including Oak and Sweet Chestnut. A public right of way runs through the bottom of the meadow but you can follow any of the paths that meander around the field. An information sign near the entrance shows the different routes you can take. In Winter look out for Ravens, Buzzards and Wood-peckers with Bullfinches patrolling the hedgerows. The bright red berries of Black Bryony still trail over the shrubs whilst rabbits and moles are in evidence. With Spring comes masses of yellow – Primroses and Cowslips carpet the field. 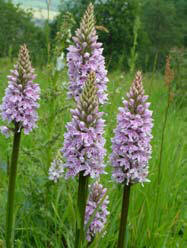 From late Spring to early Autumn you can see seven different species of Orchid but the best time is June when the field is covered in several thousand Common Spotted Orchids. Unusual plants include Herb Paris and the Spiked Star of Bethlehem. Shrews and Field Voles will be lurking in the undergrowth and Slowworms are common. Ringlet butterflies are on the field and Holly Blues on the hedges. Summer also sees a profusion of insects from small ladybirds and froghoppers through lacewings and scorpion flies to the larger burying beetles. The Elephant Hawk Moth enjoys the big clumps of Rosebay Willowherb. Hoverflies roam around the Brambles and pose on Fleabane.To find out more about insects and to get ideas on building homes for them visit Insectopia at the top of the field. From late Summer the Black Knapweed which covers the meadow is host to large numbers of bees. On wet days, wander up to Molluscopolis where many of the secrets of slugs and snails are revealed. As they love damper weather you should find several different species.